Winter Solstice has officially arrived. Today the sun reaches its minimum declination - its furthest southerly position in the sky. This is the turning point of the year. As the sun rises above Red Mountain in the Boyne Valley this morning (weather permitting), its light will enter through an opening above the passage entrance known as the 'roof box' and will illuminate the central chamber, which lies about 20 metres inside the cairn, for around 17 minutes. The lucky Winter Solstice Lottery winners will be inside, while hundreds will gather outside. This year, there will be 20 Irish wolfhound dogs at Newgrange too. It should be a great morning. The photo shows a view taken on Winter Solstice 2010 just as I was emerging from the chamber where I had witnessed the solstice illumination for the first time. As you can see, there are two beams of light. The main area of light, on the floor and the lower part of the passage orthostats, enters through the main doorway. This might have been closed by a large slab during winter solstice ceremonies in ancient times. The upper beam is a much shallower beam, and is visible higher up on the orthostats in the left of the image. This is the light that comes in through the roof box, and it is only this beam that reaches the floor of the chamber within. As we reflect upon the coming of the glorious light of dawn into the dark void, and the turning of the year, we hope that events in the wider world which have led humanity into darkness in recent times will turn also, and that the hearts of those who have resorted to anger, hatred or fear are softened, so that we can better learn to get along with each other. For that is one of the central themes of the ancient myths involving the Tuatha Dé Danann, the gods who were said to have owned and built Newgrange. When the Milesians came from Spain, to take Ireland by force, there was initially some fighting and, after losses on both sides, the Dé Dananns and the Milesians reached an accord. The Dé Dananns would occupy the sídhe, these great palaces of stone and earth that allowed access to and from the otherworlds, while the Milesians would occupy the surface of the land. And so it is that we must learn to get along with our fellow humans. We must learn to get along together. What is the alternative, except suffering and misery? 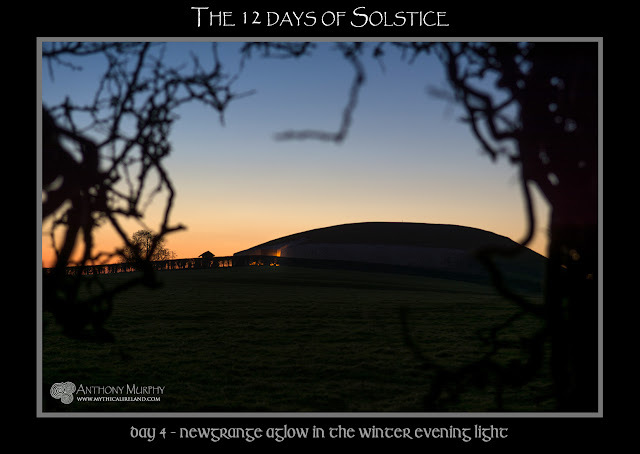 Today, as the sun shines into the heart-shaped mound of Newgrange, and warms its interior with a golden light, we ask that a light shines into the hearts of all our fellow human beings, that we might learn to reach an accord that looks to the ending of hate and discrimination, and allows for a peaceful settlement of all conflict. That is the most urgent message from Newgrange for today's world. It's day 11 of my new series of photographs entitled 'The 12 days of Solstice'. This is the second-last image in the series. It shows the sun not long after it has risen on the shortest days of the year at Winter Solstice. The picture was taken just inside the entrance of the passage of Newgrange. Above my head in this image is the specially constructed aperture known as the 'roof box'. This is the portal which allows sunlight to penetrate the entire length of the passage and into the chamber. The light that enters through the actual doorway does not reach the chamber floor. 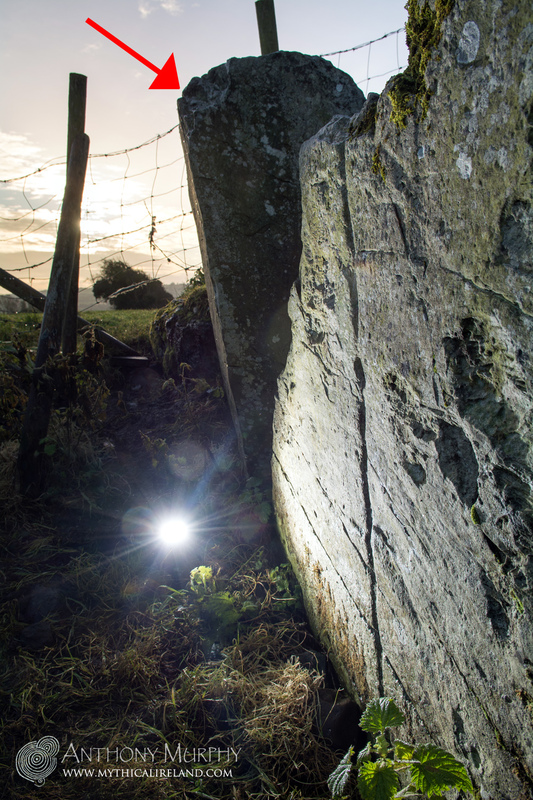 The two beams of light are kept separate by the stone seen in the top of this image. Immediately in front of the entrance is the large kerb stone, K1, which on its front side (the side facing the sun) has the famous tri-spiral design among other lavish engravings. At the time this photo was taken, the sun's light had already left the chamber again. It shines in there for 17 brief minutes. There is something very special about the quality of the light immediately at sunrise. 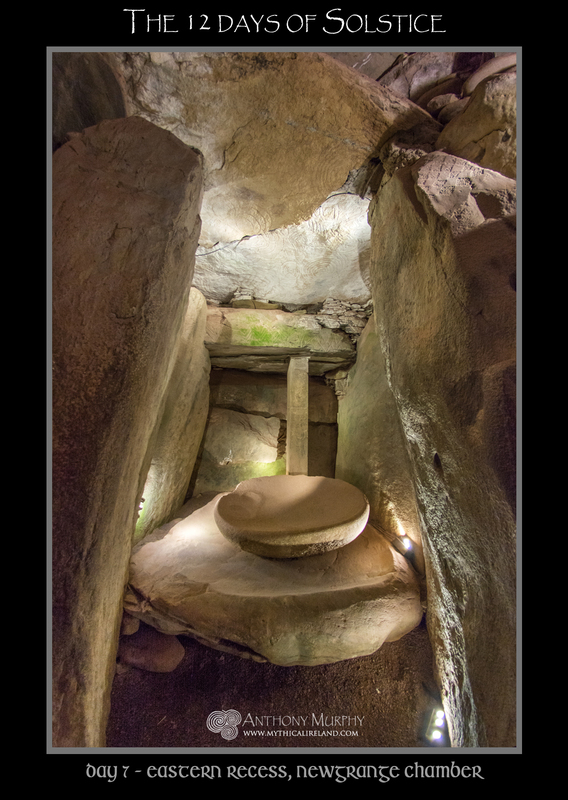 As soon as the sun rises above the ridge known as Red Mountain (Roughgrange), its golden light reaches into the corridor of Newgrange and shines a narrow beam of light onto the darkened floor of its central chamber. It is at this moment that the year is seen to have reached its turning point. The old year dies and the new year is born. Dagda, the father god, yields ownership of Síd in Broga (Newgrange) to his son, Oengus Óg, the youthful sun. From this moment, following a period of about a week when the sun's rising position has stood still on the horizon, it begins its slow movement back towards the east, and after a few weeks the light will get stronger and the days longer. 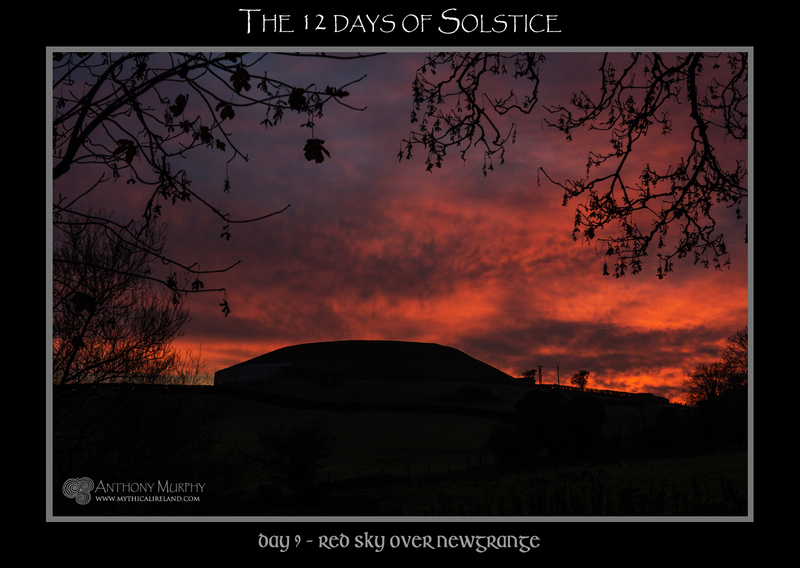 It's day 9 of my series 'The 12 days of Solstice' and today's image features a red sky over Newgrange. One of the benefits of living relatively close to Newgrange is that I get to be there regularly. This means I have seen and photographed Newgrange under many different skies. 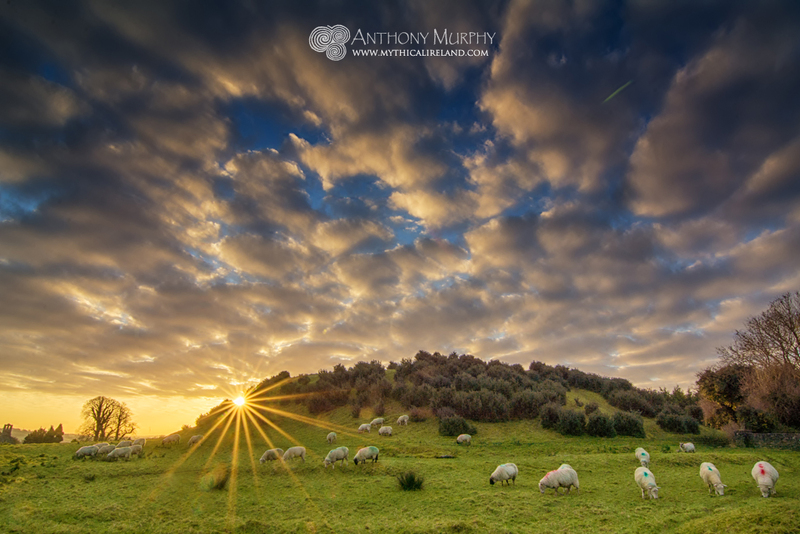 The weather in Ireland is so changeable that every sunrise is different and every sunset too. And sometimes even after the sun has set, something like the above happens. As usual with red skies, this one didn't last long - no more than five minutes - but at its peak it was beautiful. Labels: 12 Days of Solstice, evening, Newgrange, red sky, sunset. This is kerb stone 52 at Newgrange, which lies at the rear of the mound, exactly opposite the main entrance kerb stone. It is one of just three highly decorated kerb stones at Newgrange. The others are kerb 1, the kerb immediately in front of the entrance to the passage, and kerb stone 67, on the northeastern side of the kerb. 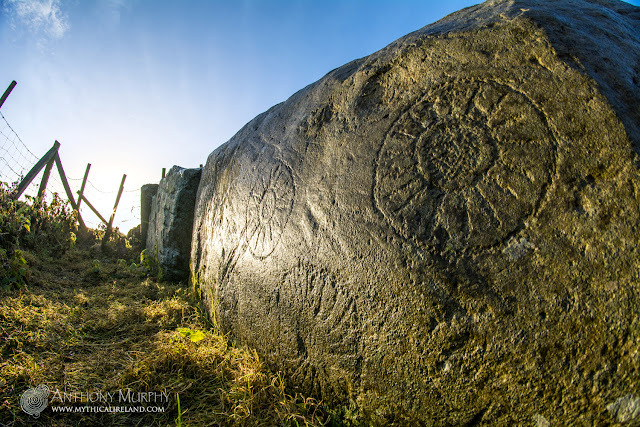 As you can imagine, interpretation of the symbols carved into stone at Newgrange and its sister monuments over 5,000 years ago is necessarily subjective, and there is a wide range of theories as to what various emblems and designs on different stones mean. My own view is that there's no great harm engaging in speculation - however, one has to be careful about ensuring that the archaeological evidence is not disputed by your theory. 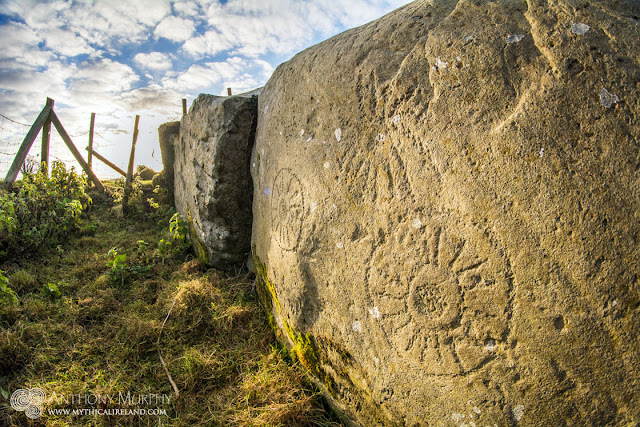 For instance, one gentleman I encountered some years ago insisted that symbols on a passage stone at Cairn T, Loughcrew, were figures including the biblical partriarch Jeremiah, sailing on a boat to Ireland. This same individual insisted that Newgrange is an Iron Age construction, and all the archaeologists are wrong about its date! My own theory (and because it's just a theory, I could be wholly wrong about it) is that it might contain symbols representing Orion and Sirius. At the time Newgrange was built, around 3150BC, the declination of Sirius was -23º 2' 43.1". This means that its rising position would make it visible from the chamber of Newgrange, out through the roofbox. A prostrate observer on the floor of the chamber could have seen this "dog star" (or whatever it might have been called back then) night after night at certain times of the year. However, due to the effects of precession of the equinoxes, a slow wobble of the earth's axis, Sirius's declination was increasing, and over the next couple of centuries it would have drifted northwards, so that it was no longer visible from the chamber. Maybe it is, maybe it's not. This is the nature of speculation. But at the very least this theory fits the astronomical evidence and does not dispute the archaeological evidence - always a good starting point! The presence of the vertical line or stripe on this stone led archaeologists to speculate that there might be another passage behind it. Prof. Michael O'Kelly excavated an area of the mound behind this stone in search of just such a passage, but no evidence of one was found. (1) Murphy, Anthony and Moore, Richard (2008) , Island of the Setting Sun: In Search of Ireland's Ancient Astronomers, Liffey Press, p.178. 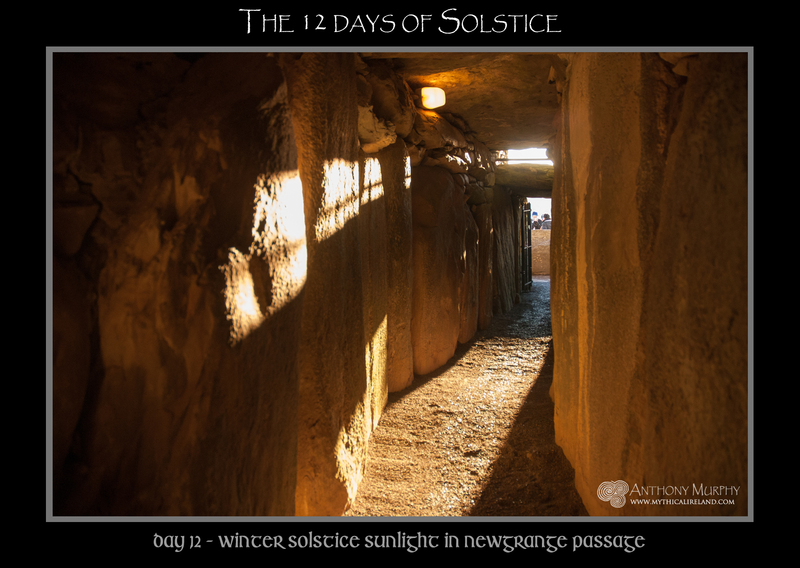 It's day seven of 'The 12 days of Solstice' and today's image features the eastern (right-hand) recess in the chamber of Newgrange. This is clearly a very sanctified space, a "holy of holies", so to speak. It is the largest of the three recesses and has features that endow it with a particular sense of preeminence, a place almost beyond encroachment by human thought or deed. The recess features a highly decorated ceiling stone, something not shared by the other recesses (admittedly the end recess has the famous tri-spiral carved into a stone forming its side wall). It effectively has two basin stones - one sitting upon the other. The smaller of the two features two hollow depressions towards its rim, the purpose of which is not entirely clear. The larger "basin" is in fact an enormous slab whose top surface has been hollowed somewhat. It is clear that this giant slab must have been in position BEFORE all of the surrounding orthostats were put in place. It is certainly not the sort of thing that could have been dragged up the passage and hauled into place in the chamber after these structures had been completed. All of this begs a question - was this giant stone the first piece of Newgrange to be put in place when construction began? By necessity, it must have been one of the earliest phases of the construction of the monument we know today as Newgrange. What took place in this sanctified space? Were these basins used for the placement of the fragmented remains of the dead? Over 2,000 bone fragments were found at Newgrange. Many were so small as to be unrecognisable. We are told at least five individuals were represented in the remains. But it could be a lot more. Clearly, there were methods of defleshing/excarnation, cremation, and perhaps there were even processed involving the pulverization of the remains of the dead. Were the bone fragments also washed before deposition in the sacred spaces within Newgrange and its sister sites? This presence of water, despite the laborious efforts of the builders to redirect the flow of water across the capping stones of the passage, etc, led one author to suggest that the presence of water in this recess might have been intentional. Jacqueline Ingalls Garnett has speculated that the intention might not have been to deposit bones in the basins, but rather to bring them in there for some special ceremony involving this "holy water". It is possible that the object was exactly to bring the packet of remains into contact with the solemn, numinous font whose water - perhaps mixed with dew - trickled from the heavens into the righthand-recess bowl. In fact, unless the entire monument had been built in order that one or two sets of bones could be laid in the bowl, the idea may well have been that it was somehow beneficial for the deceased that his bones should have an opportunity however brief to contact the water in the bowl perhaps by dipping or sprinkling. It's an interesting idea, but one wonders to what extent the huge crack in the ceiling stone (which is obviously not an original feature!) contributed to this water ingress. Furthermore, we might ask if there are other monuments of similar age and design where this is seen to happen and is considered intentional. Garnett points out something else that is interesting - the fact that a natural spring was present in the passage, a "winter-flowing stream" that emanated from under passage orthostat R8. This spring was culverted during excavation and reconstruction work, but might have been a crucial element of the sacred infrastructure of the site when it was built. Whatever took place in terms of ritual or ceremonial activity in the eastern recess in prehistory, it remains a space that demands reverence. It's not a room or space that invites one to come in and stand around. It is very much a space that stands alone. (1) Jacqueline Ingalls Garnett (2005), Newgrange Speaks for Itself - Forty Carved Motifs, Trafford, p. 35. It's Day 6 or 'The 12 days of Solstice' and today's image features Venus, the Evening Star, over Newgrange at dusk in winter. The cycles of the heavenly bodies were undoubtedly recognised by early societies across the world. At Newgrange, the yearly cycle of the sun is definitively memorialised through the alignment of its passage and chamber with Winter Solstice sunrise. Less well known is the fact that at certain times of the year the moon can also cast its light in through the roof box and into the passage and sometimes the chamber. The bright planet Venus, which is the third brightest object in the sky after the sun and moon, follows a distinct pattern over the course of eight years, sometimes appearing in the mornings before sunrise for a number of weeks or months, and sometimes appearing in the evening after sunset. After eight years, this pattern repeats. Could the builders have seen and known this? Joseph Campbell wrote about a folk belief in the Boyne Valley that suggested the morning star cast a beam of light into the chamber of Newgrange once every eight years, at dawn. Uriel's Machine authors Christopher Knight and Robert Lomas suggest that a series of eight markings on the lintel stone above the roofbox of Newgrange represent the eight years of the Venus cycle. 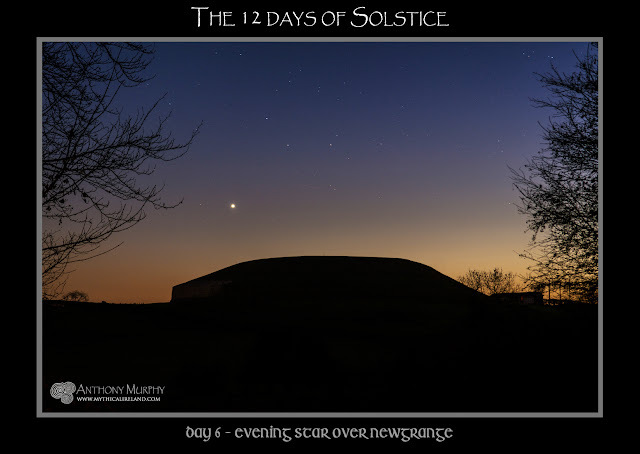 Indeed, on one year out of every eight, Venus rises on the morning of the Winter Solstice around an hour before the sun and an observer prostrate in the chamber of Newgrange would be able to see it through the roofbox. (1) Murphy, Anthony (2012), Newgrange: Monument to Immortality, Liffey Press, p.77. (2) Campbell, Joseph (1991) , The Masks of God: Primitive Mythology, Pengiun Compass, p.431. 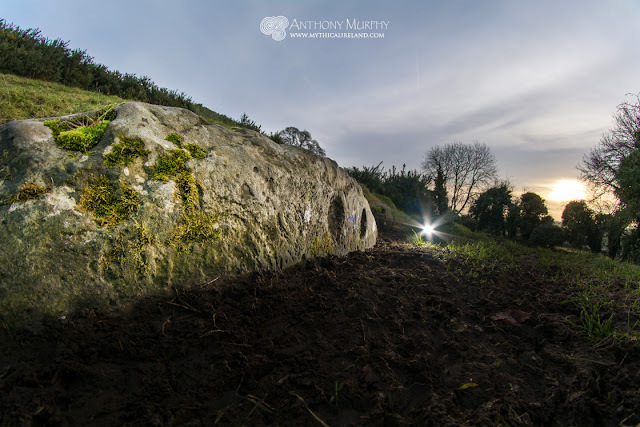 Do the myths about Newgrange and the Boyne Valley mounds offer an insight into their function? It's day 5 of 'The 12 days of Solstice' and today's image is a photo of passage stone R21, which lies at the threshold between the passage and the chamber of Newgrange. The grooves and ridges which have been formed on this stone by picking remind one perhaps of ribs. 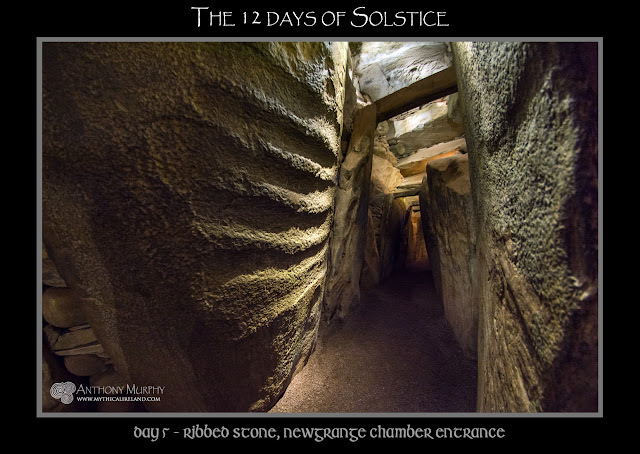 On the morning of winter solstice, the sunbeam strikes the bottom of this stone before passing into the chamber. This highly unusual ribbed stone is not entirely unique. Another passage stone, R12, features three similar grooves. Their meaning is not known. I cannot help thinking of a rib cage, and in particular an obscure myth from the Boyne Valley which may be one of Ireland's original creation myths. It is the story of the Mata, a giant monster that was ripped into pieces and thrown chunk by chunk into the Boyne River. The monster was killed at Brug na Bóinne. The myth seems typical of that cluster of myths around the globe which sees creation preceded by an act of dismemberment, something which leads creation myth author Philip Freund to entitle his chapter about it 'Out of the monster'. In all of these myths, he says, "the cosmos is carved out of some slain monster's body'(1). Mata, which is an Irish word meaning "great, dark, gloomy", was destroyed at Newgrange. 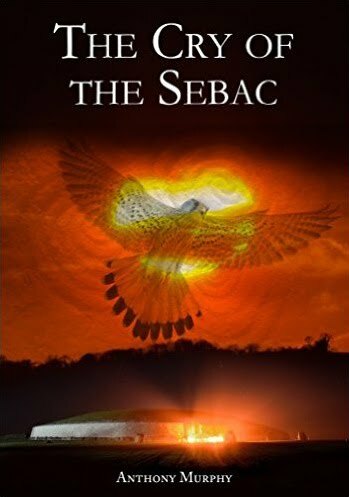 He was thrown, in pieces, into the Boyne, where his ribcage (clíab/chléib = of the framework of the ribs) made its way down along the coast and formed the ford of the River Liffey in Dublin. Another curiosity is the fact that, viewed from the passageway looking towards the chamber, this ribbed stone has the shape of a salmon. The Salmon of Knowledge is an important story connected to the Boyne - to Fiacc's Pool, which is only a short distance upriver, between Rosnaree and Knowth. (1) Freund, Philip, 2003 , Myths of Creation, Peter Owen, p.61. (2) Clark and Slover, 1996 , Ancient Irish Tales, p.598. 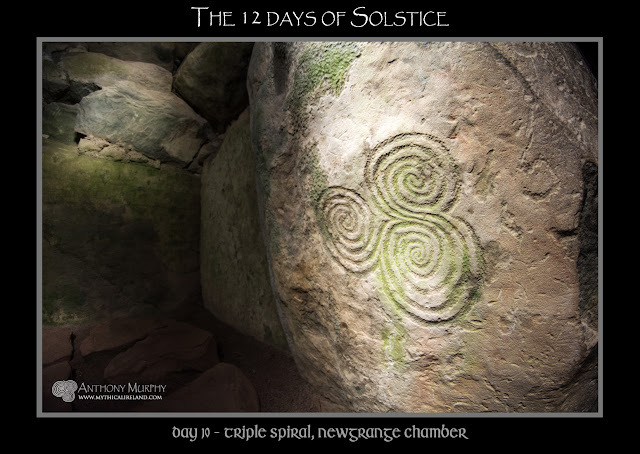 It's day 4 of my series of photos called 'The 12 days of Solstice'. Today's image shows Newgrange at twilight, with its portal aglow, as if a fire was ablaze in its doorway. One can almost imagine the Daoine Sídhe (The good people, fairies) dancing and singing there in the winter twilight. 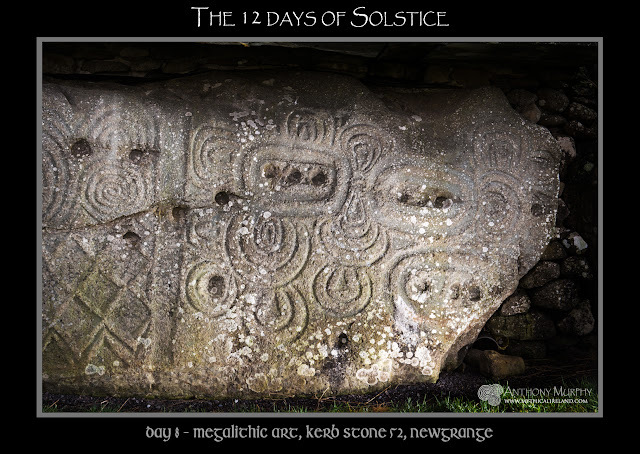 The 12 days of Solstice - Day 3 - megalithic art on Newgrange passage stone L19 ... guardian stone? 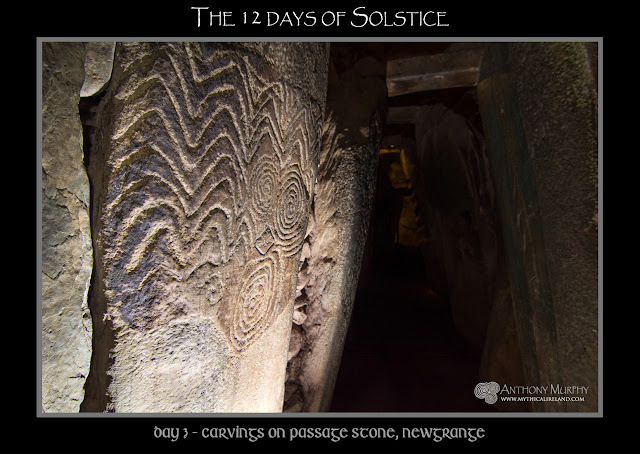 It's day 3 of my series of photographs called 'The 12 days of Solstice' and today's image features a passage orthostat from Newgrange known as L19 and its beautiful megalithic art. 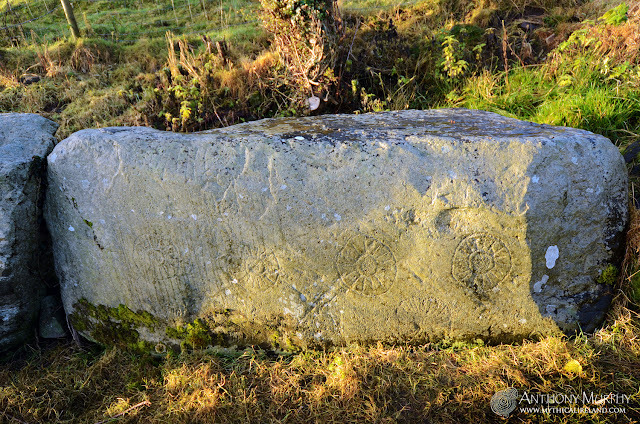 The archaeologist, Michael O'Kelly, numbered the kerb stones, the passage stones and chamber stones. 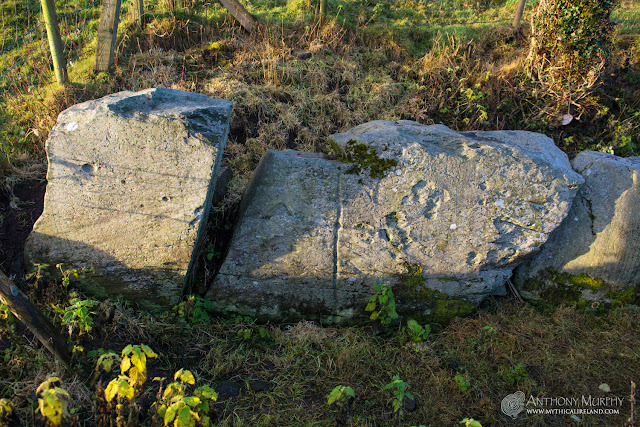 The left-hand passage stones were given an 'L' designation, the right-hand ones an 'R' and the chamber stones 'C'. L19 stands out as the most heavily decorated of the passage orthostats. Many of these passage uprights have little or no decoration. Some are pick-dressed, a technique which basically removes the outer "skin" of the stone. L19 is heavily pick-dressed above and below the zig-zags and spirals seen in this photo. In fact, some of this pick-dressing has obliterated some spirals on the lower part of the stone. We're not at all sure why this was done. 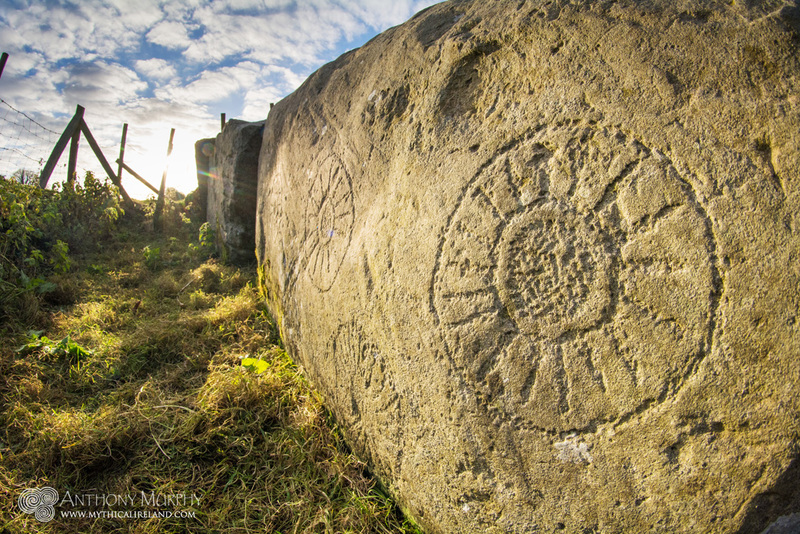 What we do know is that L19, because of this vividly carved decoration, is one of the stand-out stones of the narrow corridor leading towards the chamber of Newgrange. The arrangement of the three spirals, with a lozenge in the middle, has led to some people referring to the design as a face, perhaps of some deity or spirit. In this respect, it might be seen as a guardian stone. Labels: 12 Days of Solstice, corridor, face, god, guardian, L19, Newgrange, orthostat, passage, spirals, spirit, stone, tunnel, upright, zig-zags. 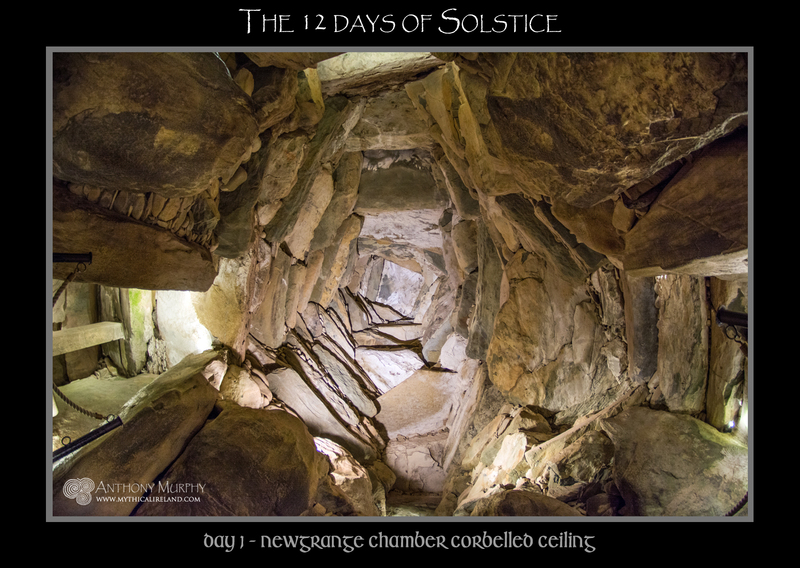 Today is the second day of my new series of Newgrange photographs entitled 'The 12 days of Solstice". 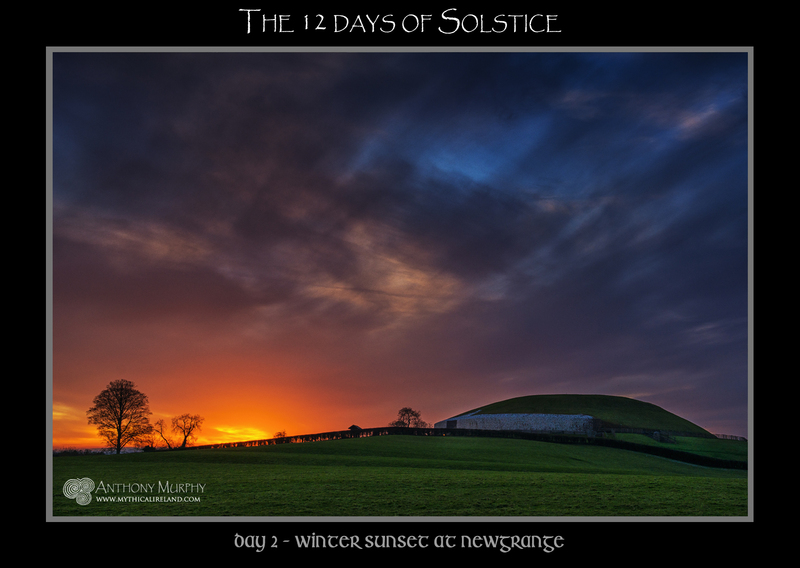 Today's image shows Newgrange in winter at around sunset. The sun has just disappeared below the near horizon, but its golden glow is still very much visible. The winter days are short in the Boyne Valley - in midwinter, the sun rises shortly before 9am and sets before 4pm. 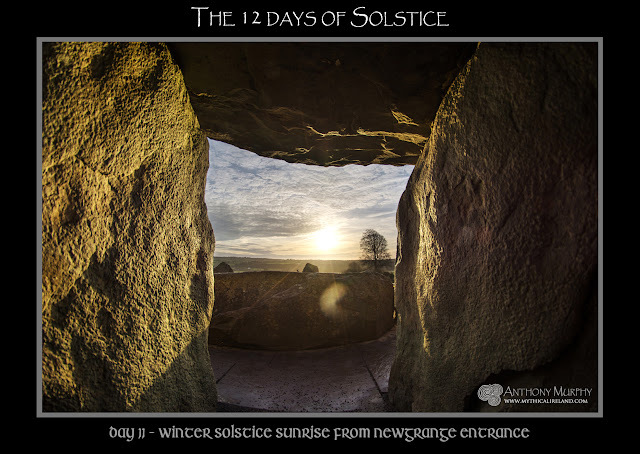 This dearth of light and heat reminds us how difficult life might have been around solstice in the Neolithic, and how important the turning of the year was to the builders of these huge monuments. As a photographer, I enjoy the special light that happens at sunrise and sunset in winter. Even when it's cold, and maybe your hands are numb from holding the camera, the golden glow of the sun helps to warm the soul. Sunrise and sunset are very special times, and provide the observer with a moment of exhilaration and gladness. One can only imagine that the builders of Newgrange experienced similar moments of bliss punctuating their lives as they grappled with some meaning behind their own existence. I've been able to spend a few mornings at Dowth recently. It's one of three of the great monuments of Brú na Bóinne (the others being Newgrange and Knowth), but is the least visited of the trio. Personally, I'm glad that Dowth retains this almost-forgotten status. It is not on the official tour. It is wild and overgrown, and many of its secrets are in the deep slumber of many centuries. I like it that way. It's a lovely place to spend time. Despite the fact that it is named after darkness (Irish Dubhadh), it presents a very interesting notion - the belief that we must experience the darkness of the longest night before the new year dawns. 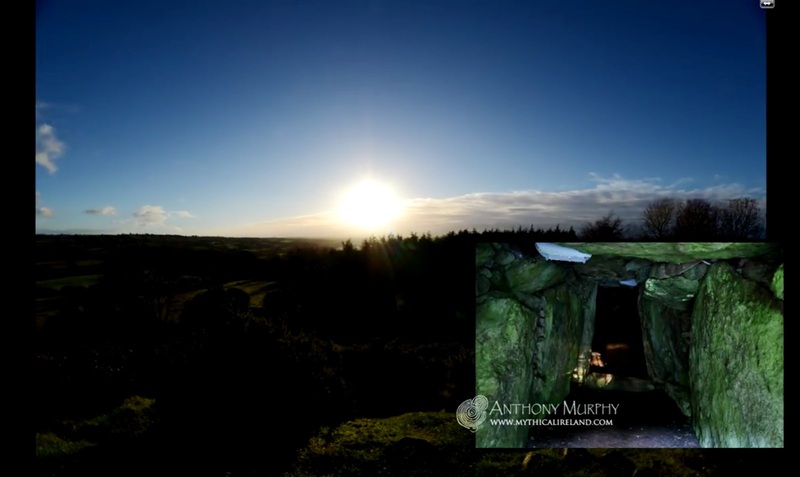 Winter sunrise at Dowth, the third great passage-tomb of the Brú na Bóinne complex. While it near neighbour Newgrange is famous for its winter solstice sunrise alignment, Dowth's alignment to the sunset on the shortest day is less well known. Discovered (rediscovered) in 1980 by Martin Brennan and Jack Roberts, it was studied in detail over the course of a number of winters by Anne Marie Moroney, who published a lovely little book about it called Dowth: Winter Sunsets. While the focus at Dowth is undoubtedly centered around winter sunset, there is something really beautiful that happens just after the sunrise on these short days of midwinter. The very well-known kerb stone 51 at Dowth, more famously referred to as the Stone of the Seven Suns (named so by Martin Brennan), is gloriously lit up by the warm luster of the midwinter sun. For about an hour after sunrise, these ancient solar symbols are highlighted in a dramatic fashion by the acute angle of the low sun. As a photographer who has spent many years photographing this stone under various lighting conditions, I can safely say that I have never seen them so impressively and dramatically in relief. It's quite striking. Below are a couple of photos showing some of the megalithic carvings, which are thought to be up to 5,500 years old, lit up by the winter sun. Some of the solar emblems on the Seven Suns Stone lit up by the low winter sun. The megalithic art is highlighted in dramatic and pristine fashion by the acute angle of sunlight. The Stone of the Seven Suns is on the eastern side of the great mound of Dowth. Curiously, over on the southwestern side, the entrance stone to the southern chamber is also lit up by the morning sun in winter time. This is due to the alignment of the stone, which is orientated roughly northwest-southeast. There are two large cup holes on the stone, referred to by some as 'Lucy's Eyes'. There is also some worn megalithic art, which appears to be part of a spiral. A good bit of the stone is still buried beneath the ground - only the top third or quarter is visible above the surface. The spiral and cup marks on the entrance kerb. I added flash to this one because the sunlight was a bit watery. For a place that is named after darkness, the sun plays a big role at Dowth. It penetrates the southern chamber at midwinter, as we know. Until recent centuries, it probably also shone into the northern chamber around the time of Samhain and Imbolc sunsets (November/February). And there may be undiscovered passageways within its huge bulk. But as I said before, some of its secrets are in slumber. For now at least. And that's just the way I like it. See more photos of Dowth.